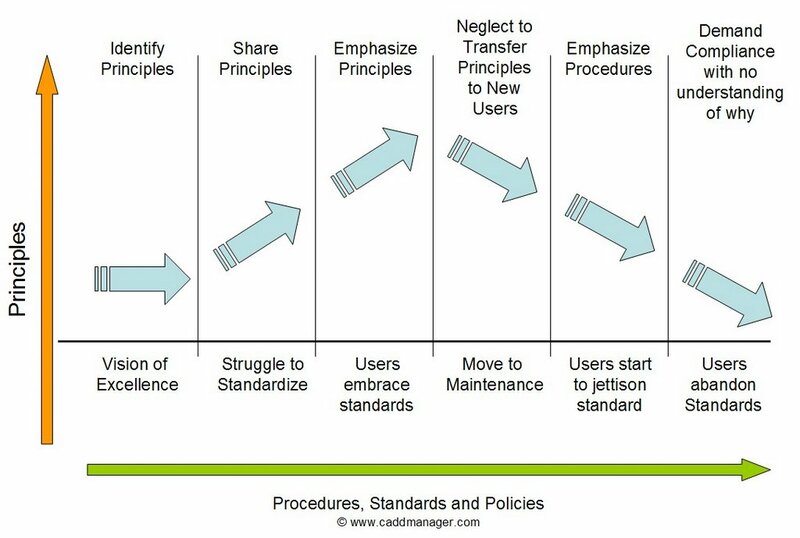 Failure to pass on the Principles of your CAD Standard to those who join your team will eventually cause your environment to fall apart. You begin by defining your principles and share them with others. As you begin to create your CAD Standard everyone is on board. They all agree with the general concepts that are driving the standards development. Once you are done you celebrate and begin to move into maintenance mode. This is when it becomes critical to pass on the principles of CAD that got you to this point. Pass it on to those who were not part of the team that created the standard. It will insure that you do not start declining (like the image above). 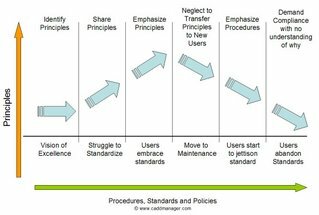 Failing to pass it on will cause your users to begin to drift away from compliance because they just don’t understand why they should be using the standard. Eventually if you do not stop this trend, they will abandon the standard altogether.